Duncan Plaza has long been where civic activity and social issues play out in New Orleans; it is well-known for being the site of Occupy demonstrations as well as temporary housing after Hurricane Katrina. 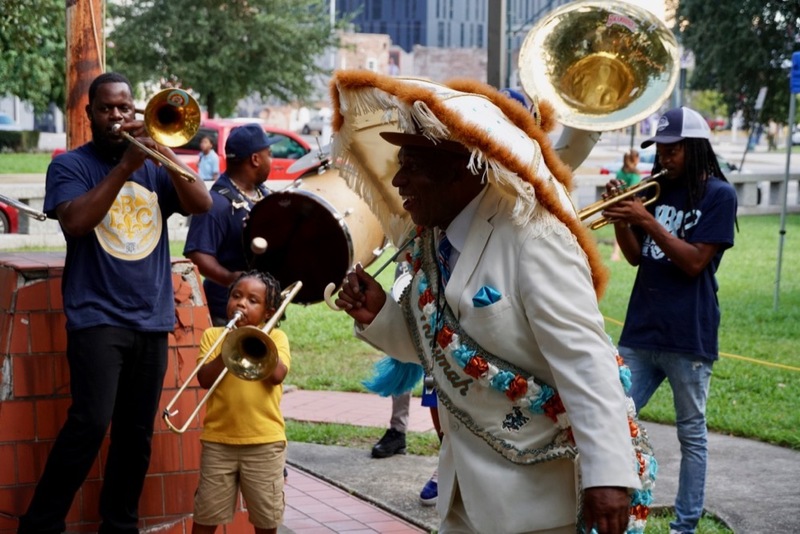 But, despite being nestled between the New Orleans City Hall and a public library, Duncan Plaza has been under-used on a regular basis, and its neighbors and users are ready to bring new activity to the space. 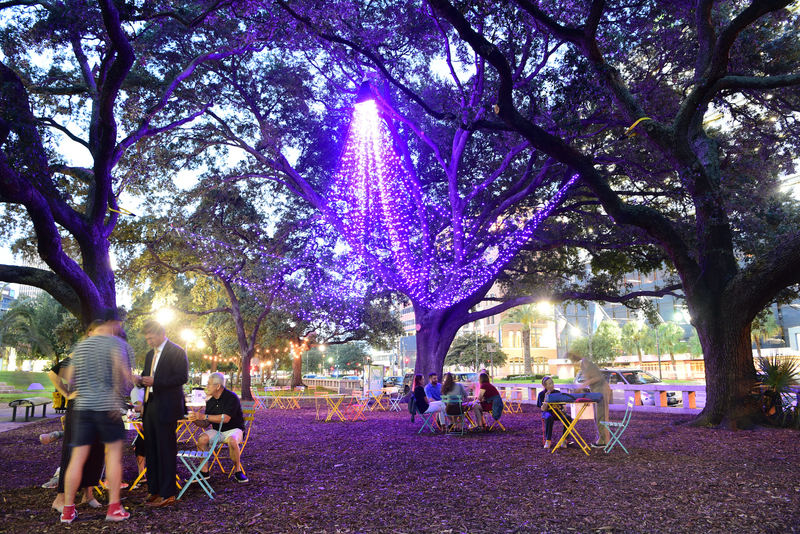 With support from the Southwest Heart of the Community grant program, PPS partnered up with the Downtown Development District (DDD) and Arts Council New Orleans to bring the imagination of the community to life in the plaza. A brass band was a lively start to the launch. 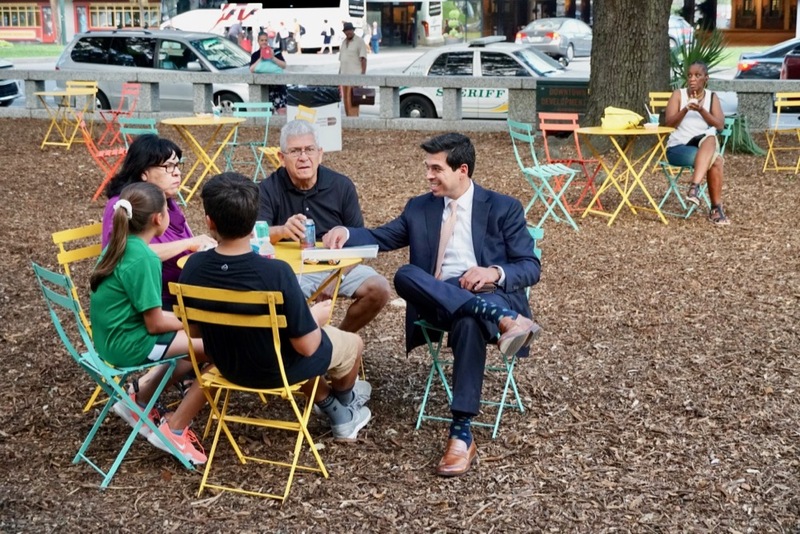 Last week, the partners unveiled new public space improvements in Duncan Plaza. With snowball treats in hand, and the excited energy of a brass band lighting up the crowd, locals were introduced to a new era for the iconic space. The launch set the tone for the space by opening up with small mural-painting activities, plenty of local food from La Cocinita, a film screening of Black Panther, and local musicians. All the festivities alluded to its future as an arts-based place, created by New Orleanians for New Orleanians. New seating areas have been added to the plaza. Before the launch, the partners started with short-term experiments that could pave the way for longer-term transformations to the park. After a comprehensive community outreach process, it was clear that users of the space wanted wellness programming, green space for recreation, and food trucks to become a part of the plaza. With this in mind, the updates began to set the stage for an entirely new Duncan Plaza. Among the first changes to the space was a wider array of seating options, the most distinctive of which were designed and painted bright purple by a local artist with One to One Architects. A temporary dog park also took over a small corner of the plaza, and since opening its gates, has demonstrated just how much local pet owners could benefit from more open space in the area. 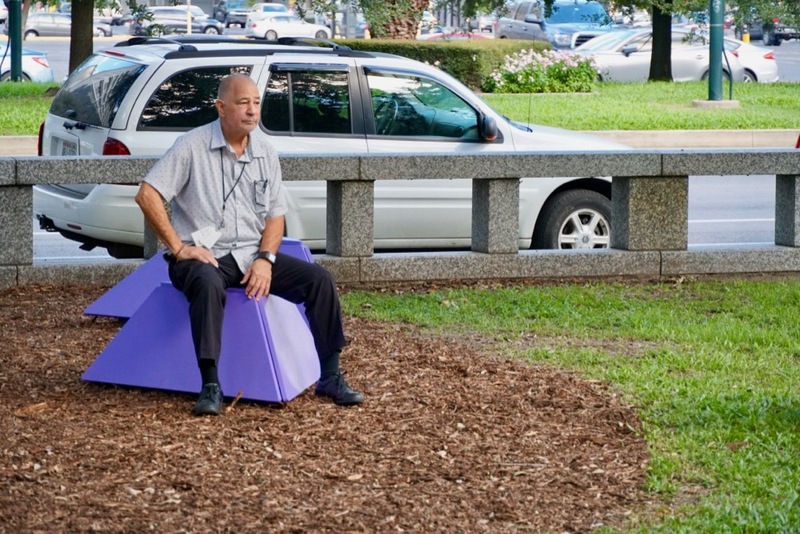 Distinctive purple seating added to the plaza's unique character — all designed by local artists. Perhaps most exciting, however, was the addition of a twinkling light installation, a purple “light cloud” hanging over the main seating area. But this won’t be the last piece of art to come to the space; longer-term plans for more art installations are underway. The space has already begun the first steps toward becoming a hub for the arts in New Orleans. The plaza has already transformed in recent months, becoming home to Food Truck Fridays, and a seasonal Wellness Series, among other programs. Guided lunchtime meditations and an upcoming arts market put on by the Arts Council continue to add to its appeal. The space hasn’t lost its civic-minded roots; now that locals have been reintroduced to the space, Duncan Plaza can mark the beginning of a new phase of its community-led future.